I have this great painting above the fireplace and want to get a new sofa . It will sit across from the fireplace. What color sofa would you get? I don't want white or off-white. There are so many colors in the painting you'd think it would be easy, but it hasn't been. Thanks for any suggestions. 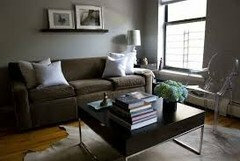 Thanks , I haven't considered gray because it's not a color I am fond of in decorating, although I love to wear gray. Any color. Your art should stand alone. What is your style? I think the candle holders on your mantel are too small in scale and do nothing for your artwork. I'd take them down, and just showcase the art you love do much. I like the artwork very much. 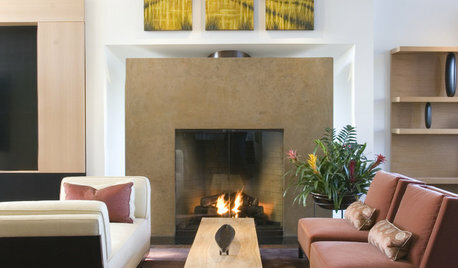 I think since your walls are painted a neutral creamy/beige I would go with a warm color for the sofa. ( I'll try to attach photos of suggestions later) Compliment the artwork, accessorize your sitting area with pillows and throws. If you don't have a crazy color carpet, get a nice size rug to balance any color scheme ( solid sofa + patterned pillows and rug) and the rug will "anchor" the room. It will be a cozy area. Thank you. I intend to take the candle holders down. 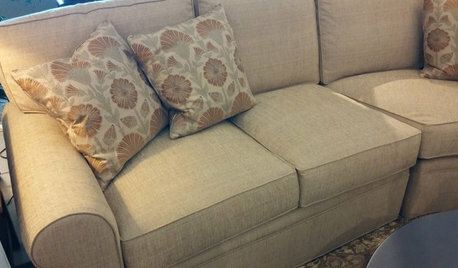 I was hoping for something neutral in a sofa so that I could use colorful pillows, throws etc. And I will probably get an area rug to add some color too. My style tends to be traditional, but casual, not stuffy. 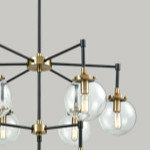 I don't like mid-century at all. Okay third time trying to post this morning..
You can jazz up the room with a rug. 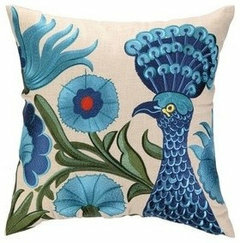 You should Google (like i did) blue sofa, brown sofa, traditional sofa etc etc and look at all the images. You'll probably see something that you like. I would go red and I'm usually the first to say blue. I i render on posting pictures too but for some reason I can't. Anyway...post your final choice. I always enjoy seeing how a room turns out. 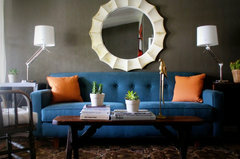 What about a colored velvet sofa from anthropologie? Thanks Vicki for the suggestion of a red sofa. A sales lady at the store suggested red also, and while I think it would definitely work, I don't think I can live with a red sofa. I might like it in someone else's house though. The teal from her right breast. Thats her right, not yours. When visitors, such as the Queen, come for tea and cucumber sandwiches, they will ask "what is the wonderful colour of this couch?" You can then answer "Right breast teal." Note, I haven't asked why she is sitting on an inflated giant surgical glove. Because it was there, I suppose. 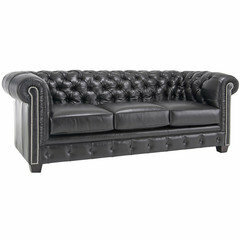 HI -- Any color sofa because you do not buy furniture to go with the Art or vice versa ! I agree with lefty47 and sandyc - art stands on its own - and especially in this painting - there are so many colors in it that any sofa would pick up one of them. Should I have nominated the red from the left breast, perhaps Lefty would have agreed with me. I vote dark blue, like a navy. 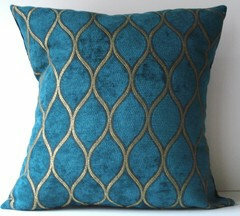 It is a neutral and any color pillow you choose will look great on it. 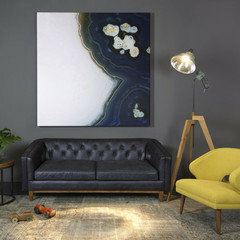 The medium blue of this sofa would work well with the painting you are trying to match. 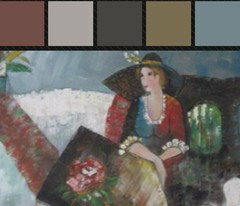 The palette that this client wanted was grey/taupe/medium blue. 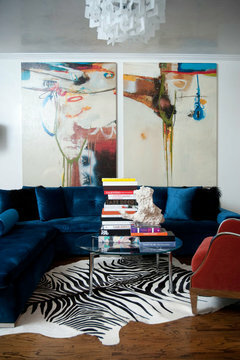 Any color blue and then use vibrant pillows that also compliment your art. Painting the wall a deep color would also be quite nice. 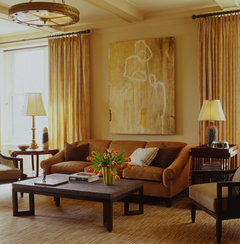 A color that hasn't been mentioned is a deep, rich caramel for your couch. I love that sofa color (bottom one) Tracey just posted with your art. A navy blue sofa would compliment this painting well! I might base a wall color on a piece of art, but not a sofa. 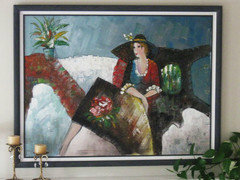 Take the art to the sofa store and see what they have in stock the you like with the picture. Thanks everyone, this has been interesting. I originally wanted a green sofa, but the selection of green fabrics was very small and so that kind of threw me off and that made me look at other colors. At this point I'd say I am thinking of a tan/camel and some shade of medium to dark blue or blue-gray. "Thinking of' and finding are two different things. Again. take the picture with you when you shop. 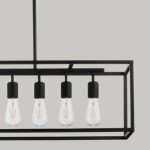 Selection may be more limited than you expect depending on where you live. Good luck sofa shopping. As most of the comments have said, any color will work. I think you should stay away from the primary colors, just because they are in the painting don't go overboard with them. Let the painting be the star. It will begin to become too matchy and contrived. 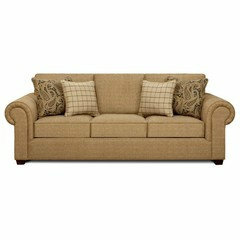 A beautiful neutral sofa either in natural linen or any other natural fabric will look great. You don't match your furniture to your art! 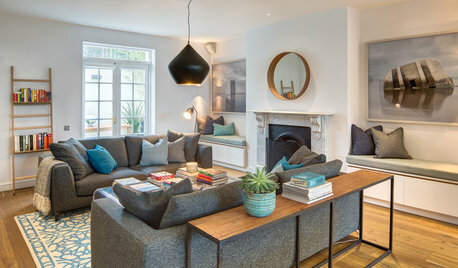 It kills me when I see photos of rooms posted on Houzz, where the sofa throw pillows match the large piece of art usually hung over the sofa. This is not the way to install art. I would do #marsala! Pantone colour of the year 2015, great classic colour. 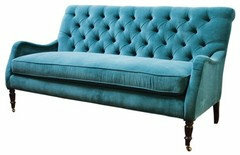 Lots of great couches in this colour this year thanks to it's fame. Thanks again everyone. The painting is much too large to take to the store (52 X 40) It won't fit in my smallish car. But I have taken a picture of it and printed that, so that I can take it. I wasn't really trying to match the colors in the painting as much as I was trying to use it as a place to start in choosing colors to use in redecorating my living room. A lot of the things in my living room will go, but the painting stays. Ah...decorating. It's never easy for me. ITC, use the white in it for trim paint, a very light blue shade from the blue background for your walls and the other colors for accent pillows, throws and accessories, including a rug. A camel, tan or darker blue sofa, like the right side of the picture would work. 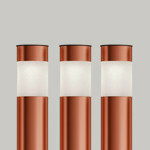 koss3, if you're doing a major redecoration, then pick a color you enjoy and run with it. That painting will support any color. 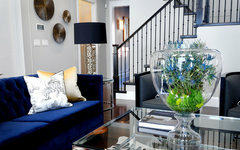 I think the style of the sofa will be influence the color you choose. 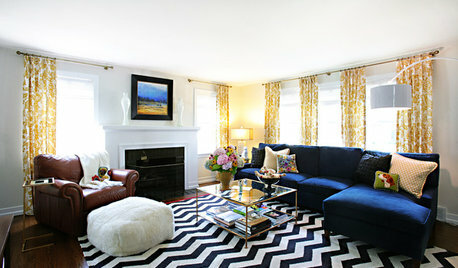 Also, with that level of a redo, I would suggest you have the "feeling" of the room you want to convey solidly in mind. Casual, formal, transitional, modern, Victorian, whatever you decide, just keep that feeling to the forefront and the pieces you need will sing to you. 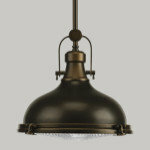 This pictures calls to me for quirky and luxurious, almost a boudoir feel! Thank you for seeking to match a sofa to a painting instead of matching a painting to a sofa. So literal! Who said you needed one colour? 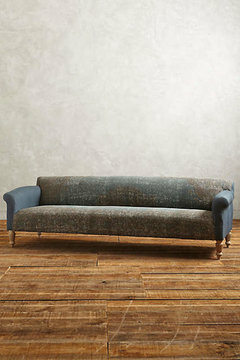 The first is Anthropologie, and absolutely ANY coloured sofa from them would be a perfect fit. Best of luck with your project! Thanks Colorsmith for the suggestion. I like green myself, and my sister has a very deep green that I like. 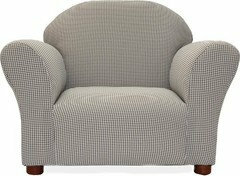 So far I haven't found a green fabric in the brand of sofa I am looking at. Very disappointing. If you can hold off for a little while, all those deep rich colours are coming back into fashion . You should have no trouble getting a deep green sofa next year. My favorite sofa ever, was a dark Forrest green velvet. I'm sure I would still have it to this day, but our cat got very mad at me for leaving him home alone for a couple of days, and sprayed all over it! But I still like the idea of dark blue for your art! At this point I have pretty much settled for blue. It's just a matter of finding the right blue in a fabric that I like. Thanks again everyone. I'm pleasantly surprised to see comments so long after I posted my question. What color sofa goes with my light Carrot color curtains? 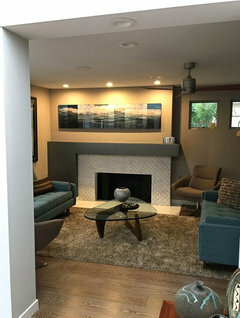 What color sofa console table for behind sofa? What color sofa for this space?